The Police have arrested two men in Lagos for allegedly engaging in an illegal registration of candidates for the Unified Tertiary Matriculation Examination (UTME). The Lagos State Coordinator of the Joint Admissions and Matriculation Board (JAMB), Mr Sunday Aladegbaye, confirmed the arrest in an interview with newsmen on Sunday in Lagos. 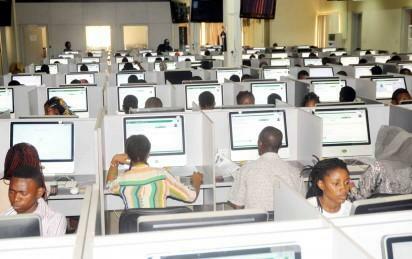 â€œTwo men and co-owners of a computer-based test centre, Vision Computer Academy, were on Saturday night arrestedÂ for allegedly engaging in the illegal registration of candidates for the 2018 UTME. â€œThe Academy is located at No. 1, Ganiyu Adeboyejo Close, Eputu London, Eputu Bus Stop, Ibeju Lekki, Lagos. â€œThe arrest, carried out by men of the Nigerian Police from Adeniji Adele Police Station, Lagos Island, was made possible after a tip-off from members of the public. â€œWe were informed that theÂ Lagos Island Primary School, Sura was allegedlyÂ being used for the illegal registration exercise. â€œThese suspects, whose CBT centre was legally accredited for the exercise, had moved a router and computer systems to an illegal location to engage in fraudulent practices and extortion of candidates,â€™â€™ Aladegbaye told NAN. According to him, the boardâ€™s preparations for the 2018 UTME is in top gear. HeÂ warned that the examination body wasÂ determined to fish out bad eggs that may try to frustrateÂ its efforts at standardising the conduct of examination and admission processes in Nigeria. NAN reports that theÂ board had postponed 2018 UTME mock earlier scheduled for between Jan. 22 and Jan. 24, to the first week of February. It had cited the ongoing strike by the non-teaching labour unions of universities as being responsible for the postponement. The post UTME: Police arrest two over alleged illegal registration in Lagos appeared first on Vanguard News.